Cards of Crypto allow last-minute shoppers to send cryptocurrency to their family and friends in the form of a personalised ecard. Buyers can choose to send either Bitcoin or Ethereum, ranging in value from $5 to $50. A $5 transaction fee is charged on top of each purchase. 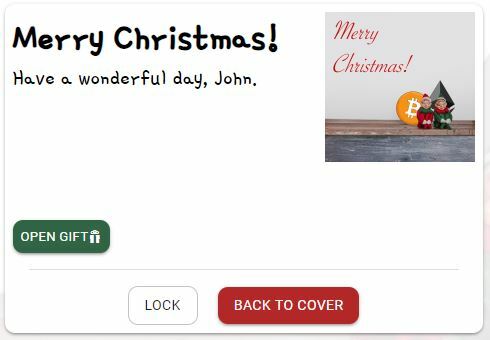 These ecards can be personalised with a crypto-inspired Christmas image and message on the front of the card, as well as a message inside the card. These ecards can be time-locked to a specific date, ensuring that the recipient can’t peek before the big day. Likewise, buyers can set a question and passphrase in order to ensure that it is claimed by its rightful receiver. Not only will you get the pleasure of giving your loved ones a gift that could potentially make them millionaires next year, but you will also be helping to support those in need this Christmas. Founded by ex-military personnel Tim Holmes-Mitra and Alasdair Macdonald, Broadhaven wants to help the estimated 13,000 ex-military workers that currently find themselves homeless across the UK. The company will donate 20% of all profits made on its crypto cards project to Crisis, a UK-based homeless charity. If you’re stuck on what to get the Bitcoin fanatic in your life this Christmas, here are a few gift ideas that will help them to prepare for the digital future. For those that don’t trust keeping their cryptocurrencies online, this cold storage wallet will provide the ultimate protection for your Bitcoin, Litecoin, Ethereum, Ripple, Bitcoin Cash and ERC20 Tokens. For those that are adamant that cryptocurrencies have a future, these watches will allow you to wear your heart on your sleeve and show your support for struggling cryptocurrencies this Christmas. These five limited edition designs, inspired by Bitcoin, Ethereum, NEM, COMSA and Zaif, are made from stainless steel and include Chronoswiss’s elaborate calibre C.2999 movement, and come with a luxury hand-sewn crocodile leather strap, making it the perfect gift for that early cryptocurrency investor that now has everything. Blockchain has done a lot of great things in the past few years, but nothing quite as incredible as CryptoKitties, a game that allows you to breed and collect digital cats. With users paying as much as $170,000 for the best virtual cats, these pieces of code are often more lucrative than bitcoin, and likely the safer bet too with the cryptocurrency market experiencing heavy declines. Sure, people may be falling out of love with virtual currencies, but virtual cats? Unlikely.